Regardless of the fact I only have 5/6 bosses so far (and some of those aren't even finished); Boss Attack mode is now in the game. I wasn't initially planning to have it 2P/Dual enabled; but I thought it would be strange to leave that out, especially as fun as playing with both ships is in the main mode. I've also rearranged the layout of the title menu somewhat, too, allowing the player mode (1P/2P/Dual) to be selected separately from the game mode itself. This should make adding additional modes easier as well. - Boss Attack is unlocked along with the Gallery and first secret ship by beating the game once. - like the Enemy Test mode, checkpoints are temporarily disabled independent of them being active in the main game. No continues are given, either. -- remaining lives give you far more points than before, although bonuses are scaled the same way, with the amount you get per life depending on how many lives you start with. -- hiscore table awards/medals are given for subsequently clearing bosses without dying, these are not reset when you die. 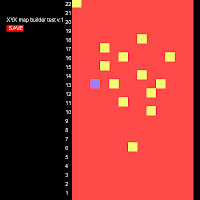 I've just made a rudimentary 'fake' scrolling tile system for XYX as well as a handy little map builder that lets me arrange them and export the arrays to a text file. Fake as in not using any of GM's predefined tile functions. This just shows some plain colored tiles; but I'll substitute these as soon as I have some real ones made. It remains to be seen, though, how efficient it will be to work with within the current system I have or even how well it'll run on my legacy PC. It might have to wait for another game... or a sequel. I also introduced some post-game 'medals' on the suggestion of a friend over at Shmups. 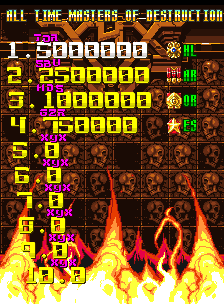 New default Hiscore table, showing perfect clear medals counting down from 4. Right now, they're only given for subsequent perfect clears and, unlike the character/ship unlocks, you lose them if you continue, so keeping them is an achievement in itself. I just thought I'd chime in on the new EDF game. I was a HUGE fan of the original, although I didn't find out about the hype for it until I had already played it for awhile. Basically, I had seen X-Play preview it months before and thought it looked flat-out awesome. Even in a short video blurb, the grand scale of the game came across beautifully and even back then, it really stood out among plenty of same-ish action titles on the '360. Even with fairly high expectations of a game I admittedly didn't know much about, I was very pleasantly surprised when I finally got to play it. There's just nothing quite like the joy of sending a giant spider into orbit with a point-blank shotgun blast and then juggling it's rigid, Styrofoam like corpse with repeated rocket blasts. NOTHING! To say I played it a lot would be quite an understatement,too. I used to cart my Xbox over to my friend's apartment nearly every weekend and, with the help of his cousin and anyone else who happened to be there, we'd blast oversized alien bugs and robots til our fingers and eyes ached. We almost completed Inferno....almost! Later, I snatched up an import copy of The Earth Defense Force 2 for the Playstation 2 and played it as long as my poor, dying Sony console decided to work. Sadly, this was not very long. I, as I'm sure many others were also, was very concerned the series changing hands to a western developer would be detrimental to the unique charm and fun that makes EDF what it is. I was worried that maybe they didn't really get what made 2017 and past incarnations so wonderful. I can confidently say now that I was very, very wrong to make this assumption. Back is the tremendous sense of scale, with entire cities to level, back is a staggeringly large collection of absurd and overly powerful weaponry, back are furious, intense battles that are as long and hard as any seasoned action gamer can stand, and back is a rag tag team of fellow EDF troopers to act as bug fodder and spout some superbly silly dialog with enthusiasm. Also back are many subtle touches that further confirm that the developers really did "get it." I admit it doesn't make logical sense for a mutant insect the size of a Greyhound bus to suddenly act like it's made of hollow balsa wood once it dies; but somehow this manages to be tremendously entertaining. If there's one important thing missing from this one, it's that bizarre and bizarrely sincere sense of b-movie authenticity EDF 2017 had. It just had some weird, wonderful and rare quality to it where all of it's obvious shortcomings made it seem that much more honest. To complement all the silly violence happening on screen, it was packed with so much funny dialog and terrible voice acting that it was nearly impossible not to laugh as you blasted wave after wave of bugs back from whence they came. It was, however, funny in a way that made it all seem unintentional, leaving you to wonder whether the translators, writers and voice actors were all in on the joke. You just honestly didn't know if they had done a crummy job on purpose. In direct comparison, Insect Armageddon's humor has a much more knowing, tongue in cheek and clearly intentional flavor. It's simply much easier to detect that they're trying to be funny. I'll grant that the loss of an undoubtedly important x-factor in 2017's mystifying equation of supreme gaming joy is a blow; but I think the game is still funny enough that it ultimately doesn't matter all that much. I don't think you can fault them for falling short in conjuring the same writing and recording studio magic that D3/Sandlot's localization pulled off the first time, either. Speaking of a loss of b-movie authenticity and flavor, the only other thing I can honestly fault Insect Armageddon on is the homogeneity of it's enemy and character designs. We know the evil space aliens that the EDF battles use giant insects to assault the Earth; but is it necessary that their robot arsenal should also feature distinctly insectoid features as well? Past games utilized truly weird and alien-looking robotic designs very much in sync with the 50's and 60's monster movies the series is obviously paying homage to, and the same goes for the troopers themselves. It wasn't long ago that we were playing as heroes that could've come straight out of an Ultraman episode, brightly colored jumpsuits and cool jet pilot helmets included. I don't consider this a huge fault, everything does look sufficiently cool; but I'd be lying to say the characters and creatures more than adequately stand out from ever-present action game menagerie of masked space marines in overly bulky armor and mechanized, killer bug monsters. - More character types, each having their own unique weapons and abilities, marking the very welcome return of EDF2's jetpack trooper. - New leveling system that streamlines the ever annoying task of weapon and armor collection. Your score counts as experience towards higher levels, which grants you more health, improves class abilities and a new selection of guns to buy. Large enemies still drop unique guns, though. - Bugs will now do cool little things like knock vehicles towards your troopers, I love that! - You can now be revived as long as you have any surviving teammates. - Teammates are now....*gasp*.. USEFUL. They will actually finish off larger enemies if you're preoccupied with something else and will come revive you as long as they are able! - You now have a separate button for running faster, so you no longer have to rely on the dodge all the time and it's easier to make a quick getaway while you reload. - A well timed second press of the reload button allows you to cut reloading time in half. Very handy! - Spiders are less of an all-encompassing threat now. - Buildings crumble in cooler looking/ more interesting ways. A bigger budget isn't so bad for a low-budget game after all, huh? - Less obvious filler levels. The action is better distributed for the most part, with some intense battles appearing much earlier than in past games. - Vehicles are MUCH improved. They control better and are much more sturdy and useful in general now. - Jetpack trooper is fun; but starts out VERY weak. I don't recommend him for 1P play at all until you've gone up a few ranks. - Less levels overall. While most tend to be 2x to 3x the size 2017's stages (minus some truly epic ones), the game's main campaign still feels much shorter than it's predecessor's. - Less variety all across the board : environments, enemies, vehicles. Memorable monsters like the giant centipede from EDF2, the enormous mech walkers from 2017, the hilarious Godzilla doppelgangers that had been an EDF tradition until now, and good vehicles like the helicopter are very much missed. - Some enemies take *way* too long to kill until you are at a high enough rank. - (nitpicky) Completing a level on a lower difficulty automatically gives you access to it on higher ones, arguably giving you less incentive to tromp through the whole thing again. Completed levels are also not marked off/colored differently, also slightly frustrating the process of multiple playthroughs. - (nitpicky) You can't perform a dodge while running. - Anthills and spider mounds can only be destroyed by setting an explosive near them (simply hold Y or triangle.) This actually makes them somewhat easier to deal with, as you are now given more distinct 'openings' to destroy them. I like that they're less of a hassle to deal with; but I do miss being able to take them out from a long ways away. People curious about the series and looking for an introduction to it might be more attracted to the high(er) budget look and sound of Insect Armageddon; but I would easily recommend EDF2017 over it. There's just no denying it simply gives you more for your buck (quite a bit more than most games at any price) as well as a better a sense of what the series is all about. Like my games? Help me out!